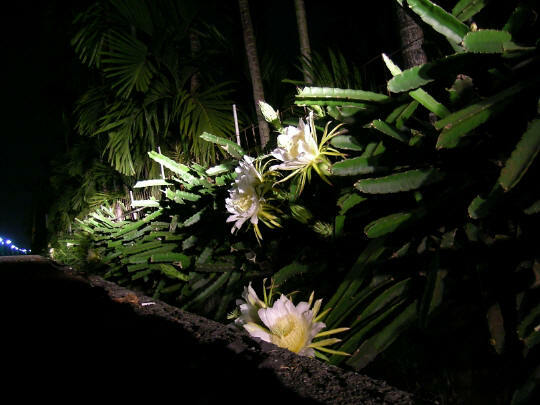 The flowers are huge ornate and beautiful and - as indicated by the name - they appear only at night and soon close after the day starts. The plant may grow out of, and over the ground or climb onto trees using aerial roots. Unopened flower buds may be cooked and eaten as vegetables. 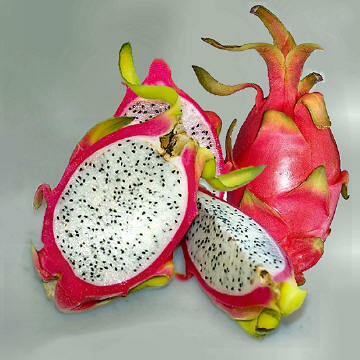 The fruit ( Pitaya or Dragonfruit) are delicious with a light melon-like taste. Origin: Widely grown around the world in tropical regions, the exact origin is unknown, but is likely from West Indies, Caribbean basin, Southern Mexico through Belize, Guatemala, El Salvador and Costa Rica. 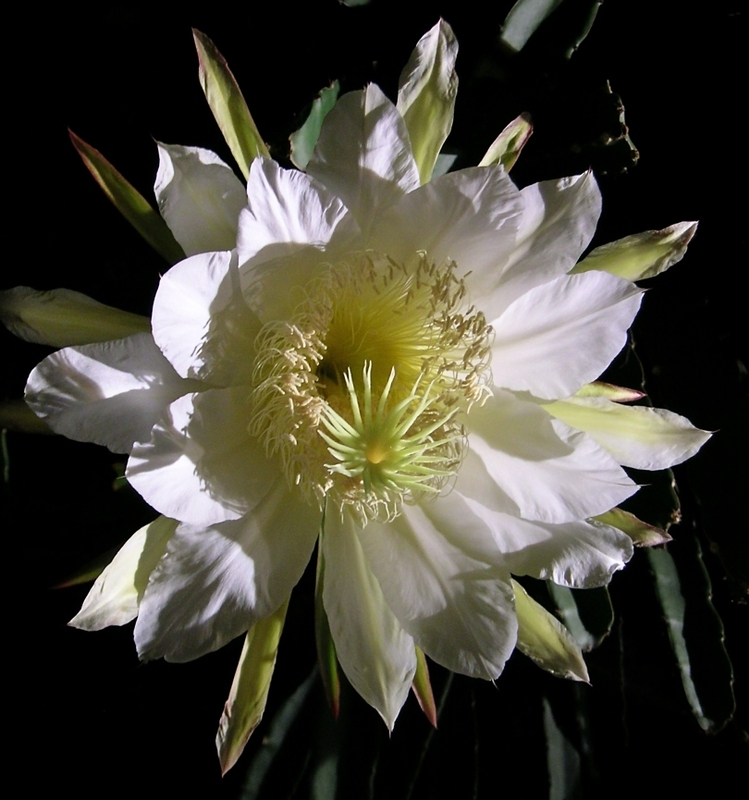 Common Names include: Night-Blooming Cereus, Pitaya, Dragonfruit or Strawberry Pear. 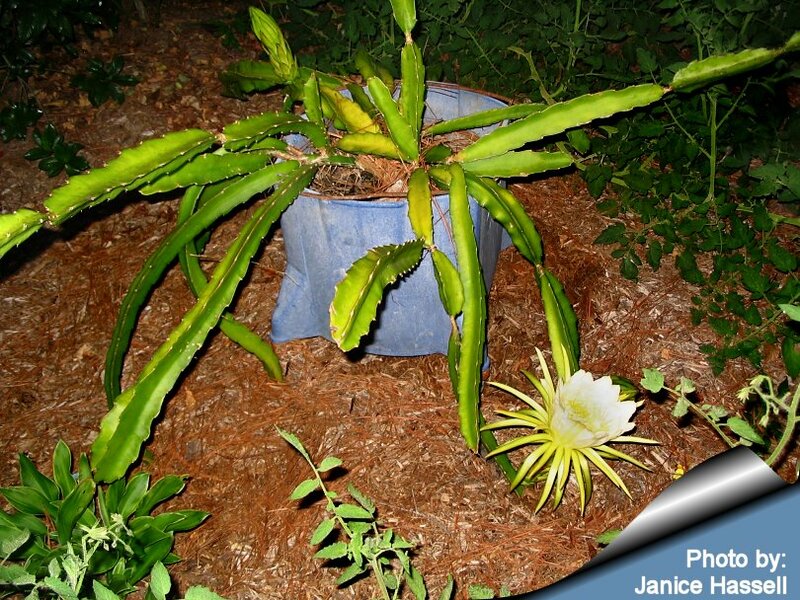 Description: Hylocereus undatus is a sprawling or vining, terrestrial or epiphytic cactus. They climb by use of aerial roots and can reach a height 10 meters or more growing on rocks and trees. 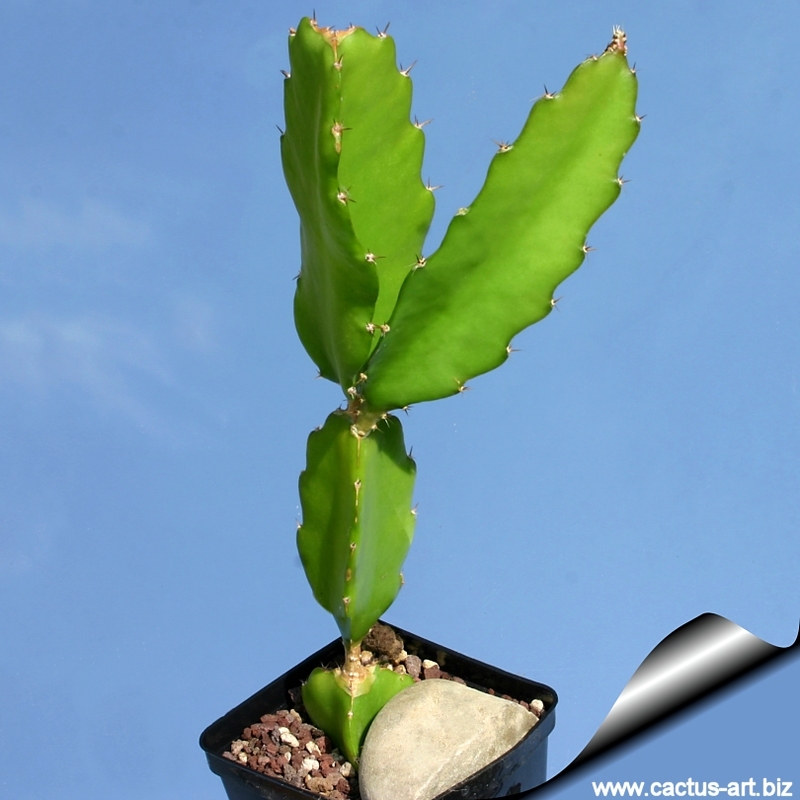 They are very variable and closely related to Selenicereus. Stems: Green 3-winged, from a few cm up to 5 m long (in mature plants), 4 to 7.5 cm margins undulate and horny wide with wings that are 2,5 to 5 cm wide. Areoles: about 4.5 cm apart. Spines: 1 to 3(- 5) conical spines up to 1 cm long (but usually about 2-3 mm long). Flowers: Flowers are ornate, fragrant and beautiful 25-35 cm long by 30 cm across , white with green outer tepals and bracts. 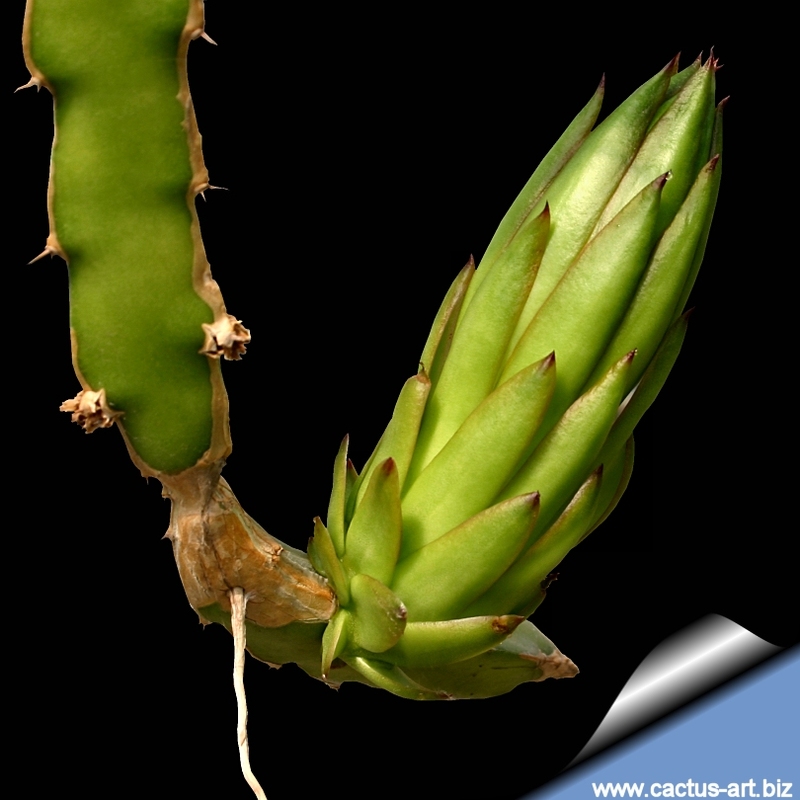 Fruit: If pollinated the Hylocereus produce edible red fruits with white pulpa up to 12 cm long. 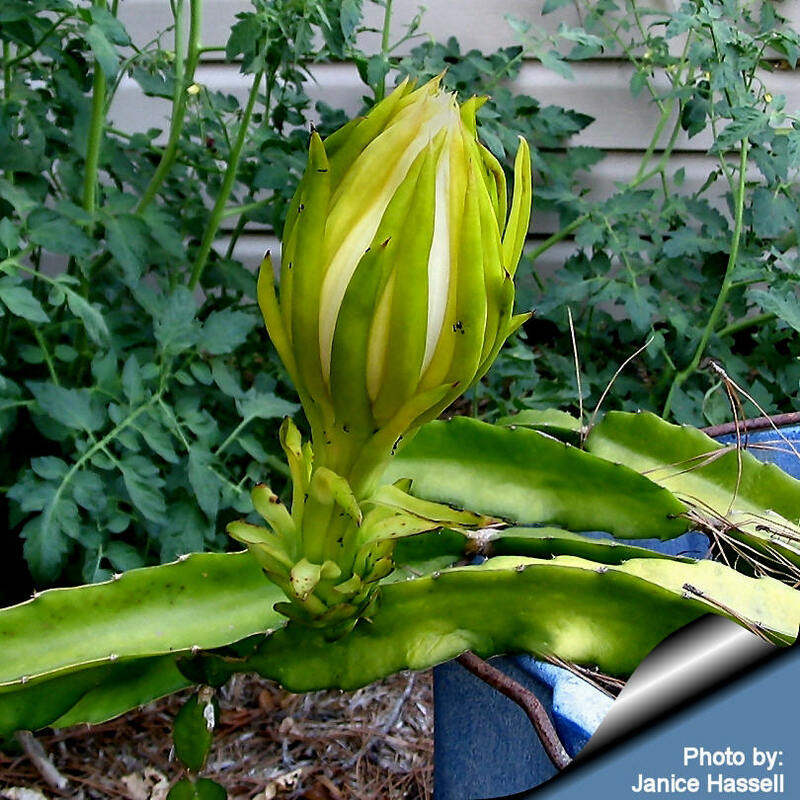 The plant may grow out of, and over the ground or climb onto trees using aerial roots. Cultivation: Hylocereus undatus grows best in dry, tropical or subtropical climates, it need full sun to partial shade. Shade is sometimes provided in hot climates. The plants aren't usually too picky as to soil type, but because of their epiphytic nature, it is recommended to grow them in well-drained soil mix that is supplemented with high amounts of organic material. During the growing season (March-August), the plants are watered on a regular basis, making sure that they never dry out completely. They are fertilized on a monthly basis with a balanced fertilizer during this period. In late August, water is restricted to about once a week until January. Night temperatures at this time should be about 10° C. In January or February, watering is stopped for a period of 4 weeks to aid in flower formation. In March, regular watering is resumed and the plant will flower in 6 to 8 weeks. Will tolerate temperatures to 45° C, and short periods of frost, but prolonged cold will damage or kill the plant. Propagation: Hylocereus undatus is propagated by stem cutting or (rarely) by seed in the spring. Seed should be sown in well-drained compost and should germinate in 14 to 28 days at 18 to 21° C.
USE: It is used both as an ornamental vine and as a fruit crop - the Pitaya or Dragonfruit. The fruit are round beautiful with an intense colour and shape, of 1 kg or more and a delicious light melon-like taste, often they red colored fruit with prominent scales. The thin rind encloses the large mass of sweetly flavored translucent white or red pulp and small black seeds. Some varieties are pinkish or yellow. To eat the fruit serve chilled and cut in half. Scoop out the flesh and seeds much like a kiwi fruit. It is also used to flavor drinks and pastries. Unopened flower buds are cooked and eaten as vegetables.